B&W 804S review | What Hi-Fi? 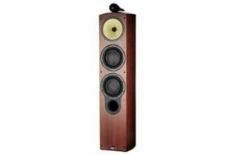 Skim through the spec sheet for these B&W speakers and the 90dB/w/m sensitivity and 8 ohm nominal impedance won't give much of a clue to the 804Ss' thirst for watts. To criticise, we'd like greater midrange bite and better cohesion between the bass, mid and treble. However, they're still a lot of fun.